The mode dial on the top of the NX210 features some familiar settings like Program, Aperture Priority (A), Shutter Priority (S), Manual, Scene, Movie, and Smart Auto. But there's also a few special modes like Samsung's Lens Priority mode and a WiFi mode that makes use of the camera's built-in wireless functions. Samsung's auto mode is called Smart Auto, which is a term Samsung uses on a wide range of appliances (their TVs are Smart, as are some cellphones and tablets). The auto mode works similarly to most modern auto modes, in that it attempts to predict what the correct shooting settings should be based on a variety of elements (like light, focal length, etc.). The mode works well a lot of the time, but it's not perfect—just like any dedicated auto mode. We found it utilized a very quick autofocus mechanism in this setting, but exposure levels weren't always consistent (strong backlight gave this mode trouble at times). All three of Samsung's new NX cams—the NX1000, NX20, and NX210—can record Full HD 1080p video using a 30p frame rate. The cameras are also equipped with a unique 24p cinema setting that reduces the aspect to a very wide view at a 1920 x 810 resolution. We haven't seen a setting like this before on a consumer camcorder, so it's fairly interesting to see here. You can also shoot video at lower-quality settings (720p, VGA, and a very 320 x 240 mode that's good for sharing on the web). Samsung touts the NX210's 8fps continuous shooting mode (at full resolution!) as one of the camera's strongest features. The setting definitely looks good on paper, and we managed some impressive results with that rate, but we also noticed the camera required a lot of processing after each photo burst. It wasn't always bad, but a few times the camera needed to pause for about 4-5 seconds after we took a burst of shots. The camera tops out with a 20-megapixel still image size option, which is very impressive for a camera of this size. 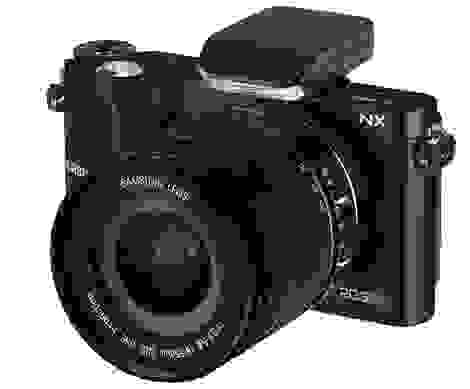 In addition to this large option, the NX210 can capture 10.1-megapixel 3:2 images, 7.8-megapixel 16;9 images, and 13.3-megapixel 1:1 images (and many more lower-resolution sizes). There are also three quality settings on the camera—Super Fine, Fine, and Normal—and the camera can shoot in both RAW (20 megapixels) and JPEG. One of the biggest additions to the NX210, and one of the few features that sets it apart from the NX200, is the addition of a built-in WiFi function. The WiFi feature lets you do a lot of stuff, so you shouldn't just think of it as a nifty way to copy photos from your camera to a computer without using cables. It allows for auto backup, sharing of photos with a Smart TV, and it can even enable you to use your smartphone as a remote viewfinder. We didn't get to see all of these WiFi features in action, but we got a few demos, and, we must admit, some of the features we saw were very interesting. We were particularly fond of the remote viewfinder function, although we have doubts that this feature—or any of the WiFi functions—is going to work smoothly for everyone all the time. Nearly every WiFi-enabled product we've worked with in the past has given us some issues at some point, so we're excited about getting these Samsung cameras into our labs in order to test the effectiveness of the WiFi.